Bulgarian media on Thursday named the suicide bomber who blew up a bus full of Israeli tourists, killing five, in Burgas on Wednesday as Mehdi Ghezali. There was no independent confirmation of the veracity of the information. The reports surfaced soon after Israel’s Prime Minister Benjamin Netanyahu had publicly accused Hezbollah, directed by Iran, of responsibility for the bombing. 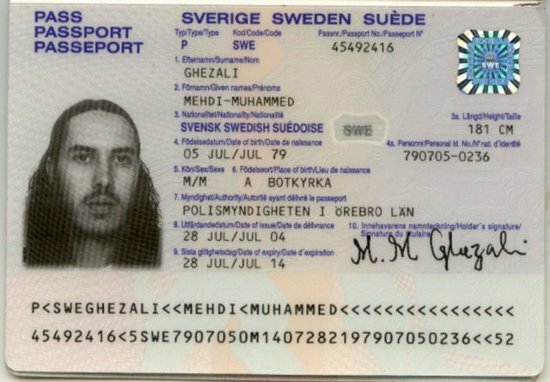 Ghezali was reportedly a Swedish citizen, with Algerian and Finnish origins. He had been held at the US’s Guantanamo Bay detainment camp on Cuba from 2002 to 2004, having previously studied at a Muslim religious school and mosque in Britain, and traveled to Saudi Arabia, Afghanistan, and Pakistan. Ghezali said he went to Pakistan to study Islam in August 2001, before the September 11 attacks which triggered President George Bush’s War on Terrorism and the US-led invasion of Afghanistan. He said he was visiting a friend in the Afghan town of Jalalabad near the Pakistani border when the US invasion started. He decided to return to Pakistan when he heard that villagers were selling foreigners to US forces. Pakistani villagers seized him as he crossed the border from Afghanistan and sold him to Pakistani police, who turned him over to the US military. He was flown from Pakistan to Afghanistan and arrived in Guantanamo Bay in January 2002, he said. He was released from Guantanamo on 8 July because he was no longer considered a threat to the United States. The Swedish press has reported that Ghezali had previously served 10 months in prison in Portugal because he was suspected of burglarizing tourists and stores. He was freed and attempted to study Islam in Saudi Arabia, but failed to do so. He traveled to London where he may have studied under Omar Bakri Muhammad, a notorious jihadist preacher. Ghezali then made his way to Pakistan and Afghanistan, where he claims he stayed with family. Press reports indicate that he is suspected of staying in a notorious al Qaeda safehouse in Jalalabad instead. Ghezali was arrested in Pakistan in December 2001. “Ghezali reportedly was part of a group of 156 suspected al-Qaida fighters caught while fleeing Afghanistan’s Tora Bora mountains,” according to the Associated Press. Ghezali was sent to Guantanamo and his story became a cause for attorneys and activists in Sweden who portrayed him as a wrongly-detained innocent. In July 2004, Ghezali was transferred from Cuba to Sweden. But the controversy surrounding Ghezali was not over. Five years after he left Gitmo, Ghezali, along with Awad, Benouada, and nine others, was detained in northern Pakistan. The group had traveled through Iran, and one member of the entourage was an Iranian. Shortly thereafter, another Muslim Swede, Sahbi Zalouti, was arrested in the same area of Pakistan. Zalouti was also picked up this week in connection with the plot against Jyllands-Posten. Ghezali’s Wikileaks file is here. He was assessed as “medium risk” with a recommendation of release to another country for detention. Update: Via Atlantic Wire, Sweden apparently is denying Ghezali was the bomber. Bulgarian officials also are denying that the bombers identity is known. Didn’t Holder defend some of the people who were released from Gitmo–perhaps not in the same timeline? With a phoney passport and Michigan DL. THAT raises questions that may never be asked. Yeah, but you can’t nail him for voter fraud. He needed that ID to board airplanes and buy Draino in Illinois. Some people think “three strikes and you’re out” legislation is too harsh. For anyone involved in attempted terrorism, it should be one strike. The stakes are too high. Sickening. More innocent people dead because the U.S. let these terrorists loose. They should take all of those damn terrorists at Gitmo out and shoot ’em in the head. I’m SICK of cow-towing to these evil people. A task difficult to the point of being impossible: Fighting a war when your government – the one charged with defending the country (e.g., Art. I, section 8, clauses 10-16) – refuses to name the enemy. Long ago Muslims declared war on anyone who will not submit to Islam. Such declarations are directly and expressly sourced in the Quran. Robert Spencer has the full listing of core Islamic texts by means of which Muslim jihadists justify their actions. The current adm. refuses to identify Muslim ideologies – Islam itself – as the source of this long standing war. The Barbary Wars (1801-1805; 1815) were the first declared fighting between Muslims (as the Ottomans) and the US. But these were NOT the first fightings waged on the West by Muslims. From Islam’s birth in the early part of the 7th century Muslims throughout history have been the aggressors. The aggression continues. The ROP website tallies more than 19,000 Muslim attacks since 09/11/01. The Bulgarian attack follows the Muslim pattern. Until we have an executive who is willing to stand by his Art. II oath of office, Islam will not only wage war against America, it will succeed. Ya know, hangin’ around doing that radical terrorist stuff. Havya checked ur tire pressure with one of those shiny things? Is he registered to vote in MI? I’m sure he still is and will turn out and vote as well. To get out of Gitmo, didn’t he have to pledge not to engage in terrorism? Wow, that means these guys break their promises. Killing innocents is one thing. But breaking a promise? Who knew? Common sense alone dictates that the recidivism rate of broken promises among terrorists is at least as high as for the blue-haired-ladies gang who “promise” to be on time and “promise” to go easy on the other ladies at the next bridge game social. Doesn’t count if they cross their fingers. I wonder if Muslim terrorists make a moon and crescent. Hey, how come crossing fingers is both good look and a promise invalidator? After squeezing private parts in a vise and multiple waterboarding sessions for information, IN the conflict area, there should be no radical islamist prisoners. Video of the terrorist is here: ‘Mehdi Ghezali, Suicide Terrorist in Bulgaria Bombing, Was Released from Guantanamo in 2004’. And you’re linked there, William. Has Obama as a representative of the U.S. come out and condemned this hate crime? Call me a conspiracy theorist if you must but it would not surprise me in the least if he were released, flown to Bulgaria, handed a vest made by DuPont, an packet of fake ID documents and told to go blow that bus up by the CIA or some such on orders from the President in the hopes of trying to trigger a larger conflagration so that Obama can jump into the middle of it and distract everyone from the election and the scandals and everything. this is the October Surprise we’ve been expecting, it is just a bit earlier than expected. Fatten em up and send em out. Ghezali was arrested in Pakistan in December 2001.